Horace Walpole and his correspondents : Social network analysis in a historical context Froukje Henstra Horace Walpole ( 1717 - 1797 ) was not only a politician , author and patron of the arts , he was also one of the most prolific letter writers in all of English history . Many of the letters which he sent and received have been collected , edited and published . They are a treasure trove of information on eighteenth - century politics , arts and society . However , the current study rather focuses on Walpoleâs social network and the language as contained in the letters of the network members . Although Walpole and his correspondents wrote their letters during a period in which the standard language was being established and written down in grammars , this book challenges the view that the language use of these members of the upper class was uniformly standard . Several case studies are used to map linguistic variety in the network and demonstrate the functionality of social network analysis in a historical context . The aim is to establish network structures in order to explain usage variation within the network . The author provides an overview of earlier and more recent work on the historical application of social network analysis , and furthermore suggests an adaptation of the model for improved functionality when used with historical data . 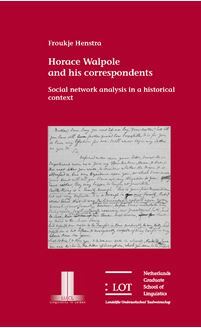 This book is of interest to sociohistorical linguists studying Late Modern English and historical linguists with an interest in social network analysis , as well as to anyone interested in Horace Walpole and his correspondents .